The analyses are due to build on the success of Globex the definitive dataset and forecast for the exhibitions industry. This next-generation dataset and forecast will provide international organisers with insight into growth opportunities by sector and the competitive positioning of organisers and shows. The workshop helped AMR establish – in collaboration with leading players – the data needs for the exhibitions industry and provided all with a sense of shared ambition. AMR looks to publish the report later this year. AMR believes in working in collaboration with both its clients and colleagues. 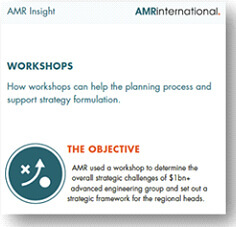 We believe workshops are one of the most effective tools to support a planning process and strategy formulation. Download our workshops infographic.